As with any project worth pursuing, there will be questions along the way. Below are frequently asked questions regarding pre-engineered metal buildings. Be sure to email or call us with any other questions you have using the inquiry form on our Contact Us page. We’re ready to help! How does the price of a metal-framed building compare to a wood-framed structure? Our prices are very competitive with wood structures. In fact, many customers have told us that our prices are significantly lower. Another advantage: a metal building typically saves 10-15% a year on fire insurance premiums. Would I be able to erect this building myself? Shenango Steel Buildings, Inc. pre-engineers metal buildings so customers with some construction experience are able to erect their own building, saving set-up costs. We are sure to provide complete building instructions, easy-to-follow plans and all the necessary anchor bolts with every structure. Our building systems make it more efficient than any of our competitor’s systems to erect a steel building. We would also be happy to erect your metal building if you choose not to do it yourself. If I have a design idea, can I discuss it with Shenango Steel Buildings, Inc. to examine the possibilities and practicality for the structure’s layout? Every steel building is designed at Shenango Steel Buildings, Inc. to the customer’s unique needs and requirements. We welcome custom work and are able to fabricate many unique metal structures for common and unusual applications. Please contact us with your ideas! Do Shenango Steel Buildings make efficient use of the interior space? 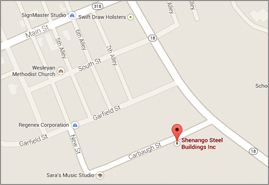 Shenango Steel Buildings, Inc. manufactures metal buildings in away that maximizes interior space. We do not taper our rafters and columns, so equipment can be placed as close to the wall as possible, utilizing floor space. We also fit girts inside the column rather than outside the column, creating interior space. Finally, our Shen-O-Deck custom-made mezzanines maximize the use of your overhead space. We can design and fabricate metal mezzanines into your new Shenango Steel Building or retro-fit mezzanines into your current building. Will using a Shenango Steel Building allow me to have a “green” building? Yes. Shenango Steel Buildings are made with 30-50% recyclable materials and many of our panel finishes meet the reflectivity and emissivity requirements set by LEED and Energy Star. Our custom roofs can be used in the construction of straw bale buildings and other environmentally friendly buildings made. Can I insulate a Shenango Steel Building? Yes. Shenango Steel Buildings accept commonly used fiber and foam insulation materials. In addition, our pre-fabricated metal buildings are constructed so ductwork for heating and air conditioning can also be installed. Interested in joining our team? Become a dealer/contractor of Shenango Steel Buildings, Inc. products. For more information on our dealer program, visit our Contact Us page, complete our inquiry form and click the box for dealer information.